RBTH looks at the history of the famous watch maker that was closely linked to Russia's aristocracy. The Russian Imperial House, like other monarchies, had their own exclusive suppliers. The coveted imperial warrant was granted with the special mark of purveyor to the Imperial family' established in 1856. Shortly after, in 1862, those manufacturers that had successfully supplied their goods to the court for at least 8-10 years received the right to display the imperial warrant on their shop signs. In the early 20th century the list of purveyors was updated twice a year – every Christmas and Easter. To secure a spot on that list, it was necessary not only to have supplied one’s goods or services to the Imperial Court for the requisite 8-10 years, but also to offer reasonable prices, exhibit one’s goods at world trade shows, and have no complaints from customers. But even when the prestigious warrant was obtained, it was granted only to the current owner of the company. A change of ownership meant that the new owner had to start the process all over again. In the early 20th century the list of purveyors to the Russian Imperial Court comprised at least 40 companies, and about 10 were foreign. These included the watch manufacturer Breguet, founded by Abraham-Louis Breguet in Paris in 1775. The company had a long history of business with Russia, dating to the early 19th century. "In the spring of 1808, having carefully pondered the issue and taking into account the delighted reviews of his Russian clients, Breguet decided to try an entirely new undertaking - namely, to open a branch in St. Petersburg," Emmanuel Breguet wrote in his book, "A.-L. Breguet. How watchmaking conquered the world,” which describes the origins of the company’s Russian business. The Russian branch was headed by Lazare Moreau. His very first meeting with Emperor Alexander I was a success, and the monarch promised his support and protection. "We have been received by His Majesty, and the Tsar told us that he was very glad that a representative of the famous Breguet was going to settle in his country, and He assured me that I would find here protection and support." Moreau soon sold several watches and clocks to the Emperor, and made many useful contacts. In November 1808, he received the official title of a watchmaker to His Majesty and the Imperial Navy. That same year, the company sold 36 watches and clocks to Russian clients, including 26 through its St. Petersburg branch. Three years later, a total of 77 items were sold, accounting for 55 percent of the company’s total annual sales. Among Breguet’s clients were some of the most powerful people in the Empire -- the Dolgoruky, Obolensky, Golitsyn, Demidov families, as well as others. In 1802, Count Rastopchin was presented a Breguet watch by the French ambassador to Russia. Sergey Pushkin, father of the great poet Alexander Pushkin, ordered a repeater clock from Breguet in 1806. Russian loyalty to the brand did not wane even during a worsening in Russian-French relations. When an imperial decree banned French imports into Russia during tensions with Napoleon, Lazare Moreau closed the St. Petersburg branch in 1811. However, this did not prevent the brand from continuing to serve its Russian customers. In the spring of 1814 Russian troops entered Paris, and several days later Tsar Alexander I personally visited the Breguet shop, though incognito. He had a chat with the company director, even shared a meal with him, and then bought a couple of watches. Experts believe it was then that the Tsar ordered Breguet chronometers for regulating the marching pace of troops at varying speeds; eight such devices were delivered to the Russian court in 1820-1822. The monarch’s interest in the watch manufacturer played a significant role in the company’s future. The flow of orders resumed, albeit not through a local branch but via intermediaries. Every year the company received at least 25 orders from Russian clients. Sometimes they personally paid a visit to its Paris store, but usually those in power preferred to order their Breguet watches through the Russian embassy in the French capital. 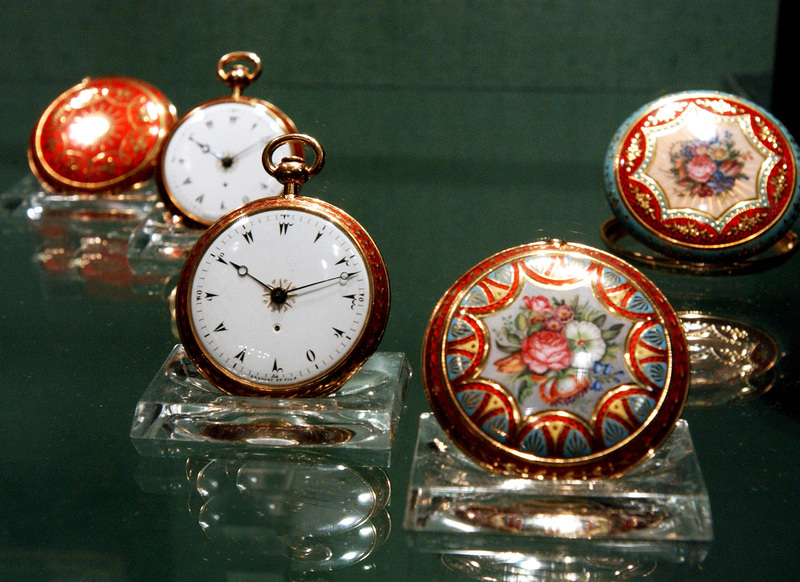 In 1814-1823, Russians bought 240 watches and the brand became a household name. Until the Revolution in 1917, Russia was the company's main foreign market. "Breguet made watches an object of worship and a symbol of prestige," said Timur Barayev, historian and watchmaking expert, and a former chief editor of Watch Russia magazine. ``The company made a great contribution to the development of mechanisms, effectively creating the first tourbillon. It was the first to make a guilloche dial, and created a special balance spring that ensured greater precision. For Switzerland, Breguet has the same national significance as Pushkin does for Russia."